This is my first ever tag. I have really been into skin care lately, trying to improve my skin and combat those early signs of ageing, so this tag really appealed to me. I was introduced to it from Harriet who blogs over at ByooteeBlog , to check out her post and answers click here . Describe your skin care routine in 5 words. Double Cleanse, Exfoliate/Toner, Eye cream, Serum and then Moisturise. If I'm allowed one more it would be a mask, which is used weekly as a deep clean. I have combination skin/normal skin. I rarely suffer with dryness or sensitivity but do get those pesky breakout from time to time. My top blemish zapper has to be the Origins Super Spot remover. It helps clear up the spot, by reducing redness and the size without drying out my skin. If I get a spot I pop this on and the healing time is halved compared to when I don't use it. All I need to say is Caroline Hiron's 3 F's..... "Face wipes are for Fanny's, Festivals and Flights". They are full of alcohol which can irritate and dehydrate your skin, they contain no goodness no matter what they say on the packet and do not clean your skin enough to be your daily cleansing aid. So Nay! The word "toner" has changed these past years, when I think of a toner I think of an exfoliating toner which will deep clean, and clear out your pores removing dead skin cells and making your skin ready for the next stage in your routine, so Yay. 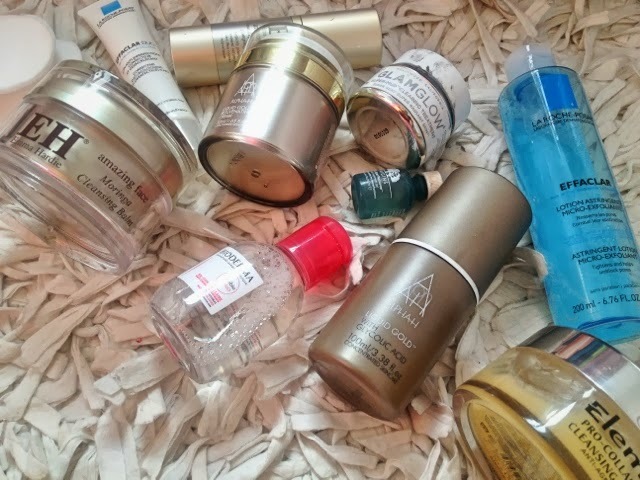 High-end Skin Care or High Street make up? God this is a tough one, but I would have to go for skincare. I think if you look after your skin and it looks good, any make up with look good on you. High street make up has come a long way and brands have really upped their game, so I will go with high end skin care. 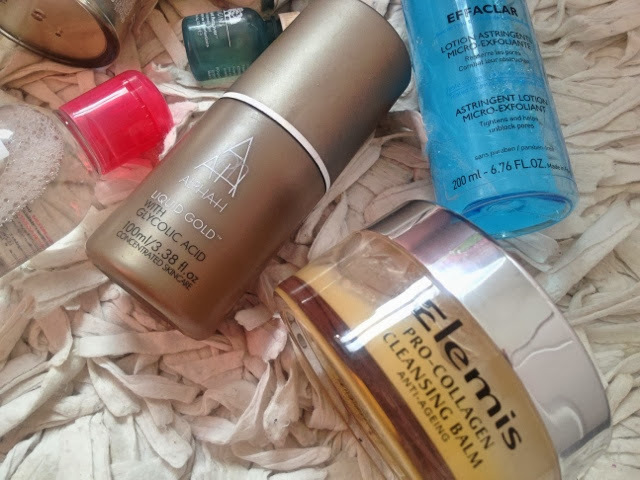 I think the most unusual product I have tried has to be Alpha H's Liquid Gold (a chemical exfoliant), just because its the first product I have ever used where you apply and leave it over night without washing or wiping off. It contains Glycolic Acid which breaks down dead skin cells. The dead skin and impurities from blocked pores are then washed away with the morning cleanse. The results have been amazing and a product I would recommend to anyone. You can see my full review here. Tell us your skin care top tip? My top tip would be to cleanse properly and moisturise everyday. If you can't do every step i.e. cleanse, exfoliate, eye cream, serum, moisturise, these two would be the ones I would recommend. If you are unhappy with your skin, looking after it and using the right products WILL change it! Once you have made these simple changes to your routine, you will stick to them to keep up the results. I know this for a fact, because only in the last 6 months have I been in a proper skin care routine and have seen a dramatic difference in the appearance and texture of my skin. And You! If you're reading this you are TAGGED!!! Going to have to give that Origins Super Spot remover a try! Everything else I have used always dries the spot out making it look even worse :/ I recently started using the Monsia Advanced Skin Renewal System and although it has only been a couple weeks, my skin is reacting really well to it. Im 32 so my must have is ingredients which will help fight the signs of aging. What kind of face mask do you use/recommend? And good to know about the wipes, although I dont use them often, I had no idea they were bad for your skin! Would you be interested in trying Arbonne products? I like Alpha H Loquid Gold too! 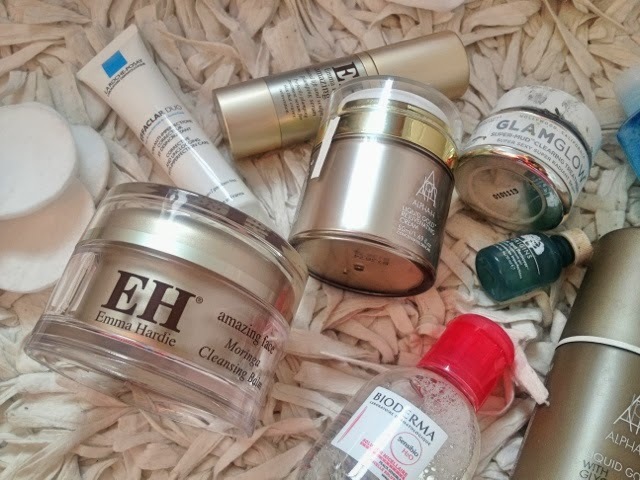 I really want to try the Emma Hardie balm too, soo many people rave about it. Most of the skin infections that we have are caused by Eyelastin and viruses. We also need to build our immune system and take adequate amounts of vitamins.